1. The Chocolate Festival was the most amazing assortment of delicious treats I have ever tasted. The shapes varied from sunny side up eggs, soccer cleats and rusty-looking wrenches to fruit engulfed in quick drying liquid chocolate! We enjoyed these chocolaty wonders by spending more than €20 ($30)! 2. The Medici Fortress of Poggio a Caiano was one of the minor villas of the Medici, but it was like a wonderland. The Italians don't know how lucky they are to have families that have past down villas that nowadays cost well over a million dollars. 3. The mineral-infested city of Rio Marina: If I'm rich one day (who doesn't dream for that? ), I would buy a house there. The city of Rio Marina is so abundant with minerals (specifically Hematite) that the gravel in the park is partly made of crushed minerals. The beach is made of sparkling black particles from the eroded mineral, and the mountainsides are a rich red soil 'growing zone' for the minerals (it takes more than a million years for some minerals to evolve). 4. 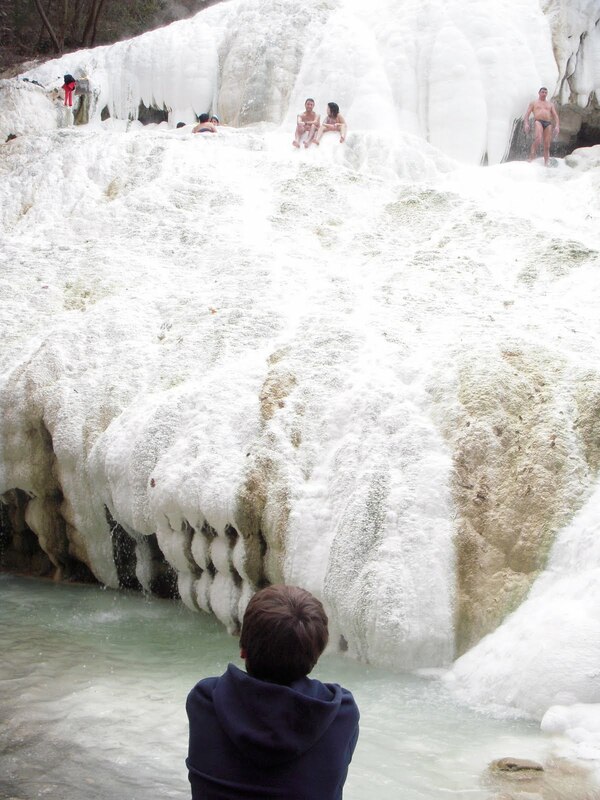 The San Filippo Hot Springs of the Maremma region are unique. The steaming hot mountain side is a distilled white from large amounts of calcium, forming in horizontal layers to rounded pools. 5. The Saturnia Hot Springs. A five star hotel could be formed around this original, yet luxurious destination. I suggest this as the one must-see/bathe destination if you go to a sulfur bath and/or through Maremma. I'll give you the top 5 for march sometime soon. Great job Caleb! I'd like to try the chocolate soccer cleat also - Hmmmmmm Good! We know you love minerals - may have to tell you about and plan to have you visit and camp at Quartsite, AZ. Very, very interesting area relative to minerals!